Obama’s foreign policy may have marked a break from the Beltway, but it has left us with an ambiguous legacy. 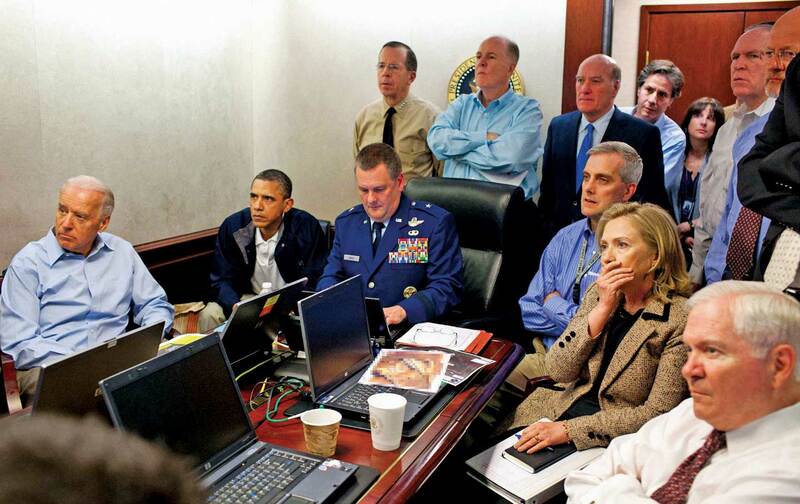 Joe Biden, Barack Obama, Hillary Clinton, and the national-security team during the mission to eliminate Osama bin Laden in May 2011. On January 20, when Barack Obama congratulated Donald Trump at his successor’s inauguration, he was no doubt anxious about his legacy—and nowhere perhaps more so than in matters of national security. While Obama did draw down troops in Afghanistan and Iraq and refused to commit ground forces in Syria, he left office with the world hovering on the brink of a precipice. Russia and the United States are engaged in the attacks and retaliations of cyber-warfare; Syrian President Bashar al-Assad is poised to consolidate his power; and the fear of terrorism lurks ever-present in the minds of Americans and many Europeans. Meanwhile, many of the promises that Obama made at the outset of his presidency have gone unfulfilled. Prisoners at Guantánamo languish, with no closure of the camp in sight; the military commissions have yet to convict any of the 9/11 defendants; the specifics of the US drone campaign remain all too secret, and the campaign itself unregulated; and holding government officials accountable for the torture committed in the War on Terror has been successfully preempted as a possibility. Every bit as troubling, though, is how Obama ruled and the kind of authority he has now bequeathed to Trump. When it came to executive power, the Obama administration legalized or further bureaucratized several of George W. Bush’s key policies in the War on Terror, including indefinite detentions, military commissions, and drone killings—not to mention the flurry of executive orders that Obama issued in his final months, which helped to set a worrisome precedent for Trump. The picture that Obama painted differs from the view held by the majority of Americans. According to a recent Pew Research poll, when it comes to “the country’s security from terrorism,” 75 percent of those surveyed thought that things had either gotten worse or stayed roughly the same since Obama’s election in 2008. A Gallup poll found that over half of those surveyed disapproved of the way Obama was handling terrorism. And while they were split on the issue of his performance in the foreign-policy realm, Obama’s overall rating was under 50 percent. Whether or not this lukewarm and at times distrustful view of Obama’s role as a national-security president was a foregone conclusion is a question that historians will wrestle with for decades to come. But for now, three new books—Mark Landler’s Alter Egos, Jameel Jaffer’s The Drone Memos, and Mark Danner’s Spiral—capture how Obama aimed high in his rhetoric and ideals, and yet was often frustrated in realizing his goals. Landler, a New York Times reporter who most recently served as the paper’s White House correspondent, compares Obama’s foreign-policy vision with that of Hillary Clinton, finding in the latter’s traditional hawkishness a perfect foil for Obama’s restrained ambivalence. Jaffer, a former deputy legal director at the ACLU and current director of the Knight First Amendment Institute at Columbia University, presents and examines a number of government documents surrounding Obama’s drone program. And Danner, who has long reported for The New Yorker and The New York Review of Books on atrocities and human-rights violations, has turned what began as the Tanner Lectures on Human Values at Stanford University into a lengthier and more theoretical disquisition on the long-lasting costs imposed on this country by the War on Terror. Taken together, these books remind us that the Obama administration’s foreign-policy failures were less about a specific vision and more about the daunting realities of 21st-century geopolitics and the intransigence of the US national-security state. Accordingly, the president—unlike Clinton and the establishment that had directed foreign policy for decades—was uninterested in the idea of spreading US-style democracy to foreign lands. After the Iraq and Afghanistan wars, Obama was wary of wasting American blood and treasure in countries where the problems, at least in his mind, were beyond the capacity of the United States to fix. In this regard, Obama defied the country’s foreign-policy elite and the basic tenets that it has clung to since World War II. Whether it was the Iran nuclear deal, the US role in Afghanistan and Iraq, or the Israel-Palestine conflict, Obama was often “deeply reluctant” when it came to the prospect of foreign entanglements and head-on conflict. Landler calls this approach “half hearted,” but it was also steadfast and motivated by a lifelong “cosmopolitanism” that resisted a purely America-centric view of the world. For Landler, the expansion of the targeted-killing program was one more example of Obama’s “broader refusal to project American power in more direct ways.” For others, including the president himself, the use of targeted strikes forged a viable path between war and the mandate to keep the country safe. Targeted strikes, Obama insisted until his last days in office, “remove terrorists from the battlefield, which protects our troops and has prevented real threats to the American people.” Landler avoids addressing how, in the context of Republican politics, Obama and Clinton were considered not that far apart; instead, he focuses on their differences, and he also seems to take a side: Landler prefers Clinton’s approach to foreign policy over Obama’s. By attempting to avoid war but also to execute military actions in the interests of American security, Obama’s half-hearted cosmopolitanism, Landler believes, is significantly less effective than Clinton’s respect for the uses of hard power. Of course, while these targeted strikes served to limit American entanglements abroad and diminish the prospects of groups like Al Qaeda, their devastation has also radicalized people throughout the countries where the attacks occurred—and beyond. Insisting on the precision of these attacks, Obama nonetheless acknowledged that “we still have critics who suggest that these strikes are wrong.” Those critics have, over the years, been deeply ambivalent about, if not flatly opposed to, the targeted-killing program for a variety of reasons. Strategists worry about how the strikes might become tools for Al Qaeda and ISIS recruitment; constitutional lawyers and civil-liberties advocates emphasize the legal deceptions and shiftiness that undergird the drone campaign. Jameel Jaffer spent much of the Obama years in the latter camp, and in his new book The Drone Memos, he lays out the legal—and moral—problems with the use of targeted killing. Whereas Landler is preoccupied with the consequences of Obama’s determination to opt out of major international conflicts, Jaffer is more concerned with Obama’s opting out of responsible disclosures regarding the legal reasoning and actual activities of the drone campaign. His administration repeatedly refused requests by the ACLU and others for documents detailing the program, forcing the ACLU to take the matter to court; the group has also litigated on behalf of drone-strike victims. To correct these obstructions, Jaffer uses his new book as a way to introduce 16 government documents written between February 2010 and July 2016, which include a combination of Justice Department memos, executive orders, and speeches made by US officials. Jaffer’s ambition is to lay out the ideas and legal justifications that were used to enable the exponential growth in the use of drones. Among the documents included in the book is a long-sought-after (and still redacted) set of 2010 memos by Justice Department lawyers David Barron and Marty Lederman that outline the government’s legal rationale for the killing of US citizen Anwar al-­Awlaki. Several consequential White House documents are also included, such as the Presidential Policy Guidance on targeted killings from 2013, as well as an executive order on targeted killings from 2016. Jaffer makes a strong case for the drone campaign’s wrongfulness, condemning the bad-faith usage of the letter and the spirit of the law, and itemizing numerous procedural deceptions that helped create and sustain the administration’s program. Obama’s years in office, Jaffer argues, produced “a remarkable feat of legal alchemy.” Utilizing a variety of sophisticated legal arguments to justify its policy decisions, the administration ducked human-rights law and took refuge in the broader allotments of the laws of war, often perpetuating many of the kinds of tactics that the Bush administration innovated in the early 2000s. But Jaffer’s deepest frustration comes from Obama’s willing use of “fiction”: He assured the nation that the drone campaign “is kept on a very tight leash” while simultaneously “bureaucratizing the program” and thereby “normaliz[ing] it”—a development that led to “a loosening of targeting standards” and uncounted scores of civilian deaths. For Jaffer, this secrecy in bypassing the law portends an “ominous” future. “A dangerous legacy of the Obama presidency is a legal regime in which executive branch actors are judge, jury and executioner,” and “a stroke of the next president’s pen” can enable the use of lethal force without the constraints that a democratic government should provide. Jaffer wrote his book before Trump’s election, but this warning about unchecked executive power now takes on an even graver register. Its dangers include not only the overreach and lack of accountability demonstrated in the targeted-killing program, but also a penchant for secrecy that, despite some last-minute releases of intelligence documents, will remain one of the defining characteristics of Obama’s administration— a precedent that could very well be abused by a less disciplined, less lawful president. While Jaffer zeroes in on the drone campaign and its horrors, including the blowback that results in new terrorist recruits and the loss of intelligence sources when targets are killed rather than detained, Mark Danner widens the lens to offer a broader view of the toll that the War on Terror has taken on American liberties and values. Borrowing a phrase from the historian Michael Ignatieff, Danner argues that things have gotten worse in the “escalatory spiral” that resulted from the United States’ legal compromises and unwinding of basic principles with its policies on torture, detention, and targeted killing via drones. From Danner’s perspective, this breakdown of American law has proved to be a “self-defeating spiral” propelled by fear. Spiral is at once a lament and an accusation. For Danner, the War on Terror has brought the country to its knees as, time and time again, fear has triumphed over the basic principles on which the nation was founded. Sequentially, Bush and Obama made permanent the emergency “state of exception” that was implemented to deal with the crisis of 9/11 and its aftermath. The Bush era, Danner argues, was normalized by Obama, who took the improvisational, secretive executive authority of the Bush administration and turned it into law and overt policy, thus “furthering its evolution into permanency.” “The politics of fear” has been the weapon, and our values have been the victim. Taking his cues from the Italian philosopher Giorgio Agamben, Danner points to the fringes of the law as the place where we can track how our current state of exception came into being. Throughout his book, Danner takes Obama to task for not doing more to correct the imbalance between liberty and security that he inherited from Bush. In his portrayal, Obama is a conflicted soul, caught in the quicksand of a permanent state of fear and the seemingly unstoppable momentum set in motion by Bush, and yet Danner also focuses on the contradictions between Obama’s stated intentions to change this system and his accomplishments. One particularly glaring example for Danner is Guantánamo. Obama repeatedly insisted that Guantánamo and other extralegal policies are “not who we are,” and yet these practices are still in place; in fact, in some cases, the permanent “state of exception” that has defined the country since 9/11 has even been expanded. Danner’s book builds to a crescendo, reading like a soliloquy in a Shakespearean drama, in which the actor turns to the audience to explain the tragic irony of what has happened. For Danner, the tragedy of the Obama years lies in the fact that the downward spiral into this permanent state of exception has realized bin Laden’s dream of attracting more and more Muslims to the caliphate and disrupting the moral and political authority of secular, liberal democracies in the West. While Danner may at times go overboard in his pursuit of telling this Shakespearean narrative, his essential point is well-taken. The country is now living in a permanent state of exception—one that at this point is largely of its own making. The option “to begin anew,” as Danner puts it, was not available to Obama. But he could have done so much better—and chose not to. Call it what you will—half-heartedness, hypocrisy, naïveté, imprisonment, schizophrenia, or, in the words of many, pragmatism—but the distance between Obama’s initial and deeply held aspirations and his subsequent policies is worth some reflection, in particular as we face down a Trump presidency. Last spring, The Atlantic’s Jeffrey Goldberg published an extended interview with Obama. Talking to the president over the course of several meetings in several locations, Goldberg settled on the phrase “Hobbesian optimist” as a characterization of Obama’s foreign-policy outlook. Hobbes was known for his pessimistic view of humankind when left to its own devices, and so at first this phrase seems to be an oxymoron. But it’s an apt label for a president who once ran on promises of “hope and change” but who wound up ruling with a deep sense of the limits of American power abroad and his capacity to change it at home. Obama tried to have it both ways: He aspired to be an idealist and a realist, an optimist and a pessimist. He entered his first term committed to reinstating the constraints imposed on the presidency by the Constitution, and yet he left office having helped to normalize and legalize the executive branch’s overreach. As a result, he alienated the people who could have been his closest allies: those progressives hoping for a new kind of foreign policy. He also found himself quickly angering many in the Beltway’s foreign-policy elite. Obama’s critics, myself included, have taken him to task for years now for not doing enough to address the wrongs of the forever war launched by Bush, and also for yielding, despite a fight, to the demands of the national-security state. Landler, Jaffer, and Danner remind us of the long-lasting wounds created by this fight and the failure to win it. Though he took some steps away from intervention, and ramped up the transfer of detainees out of Guantánamo in the last year of his presidency, Obama ultimately made insufficient headway when it came to restoring the basic principles of US law. As Landler points out, he ultimately failed to turn the corner from exceptionalism as a basis for American foreign policy. What we are left with is the unwavering sense that the United States is now a profoundly changed nation, one created by a combination of the abuse of executive authority that defined the Bush years and Obama’s failure to create a new strategic vision. Despite his best intentions, Obama could not overcome the relentless attachment of the national-security establishment to what Landler describes as America’s long-standing commitment to “carrying the world, Atlas-like, on its shoulders,” which persisted to the very end of his presidency. Now, with the Obama era fading into the background and the Trump era commencing with a clear and uncompromising disregard for the rest of the world, one can’t help but wonder whether the worldview that Obama represented will all too quickly become “quaint” and “obsolete,” to quote former attorney general Alberto Gonzales’s description of the Geneva Conventions in the post-9/11 era. If that turns out to be the case, then the constitutional norms that Jaffer and Danner embrace are ones that the country will need to rally behind—not just the limited circle of civil libertarians and constitutional lawyers who were committed to them during the Bush years. These books serve as a grave warning of just how intransigent the national-security state is—even when a president like Obama seeks to roll back many of its features—and just how vigilant we must remain to protect what is lawful and moral in today’s America.